The wall murals of modern patterns featured in this collection inject personality, color and energy into your space. 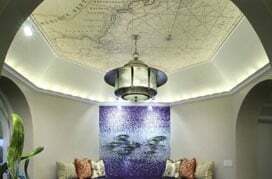 Each mural you see here has been handpicked by discerning experts for its artistic quality and creative treatment, use of color and texture and its unique interpretation of the subject. Featuring a mix of portrait, landscape and square murals available in many sizes, this collection offers you plenty of choices for the walls in your space, be it a room in your home or a corner in your cafe. These wallpaper murals showcase the extraordinary use of myriad colors, modern motifs and artistic techniques to bring out texture and visual depth. These wonderful pop art wall murals draw inspiration from the great masters and deliver it with a refreshing twist. The blend of the vintage with the trendy and the classic with the contemporary renders these wall murals of modern patterns excellent additions to your space. Choose from Warhol-inspired collages presented in eye-popping neon and pastel colors, elegant vintage-inspired floral art, vibrant abstracts, wood patterns highlighted by bright colors, geometric patterns, interwoven tile designs, mixed media word art collages and more. Concentric circles, intriguing spirals, a splash of fall colors and symmetrical designs are just a sampling of the wallpaper mural choices available to you. These murals have the potential to make your space pop with color and character, whether you use them to create a feature wall or to punctuate a blank canvas. It may surprise you to see how big of an impact the addition of a wallpaper mural can make to any space. 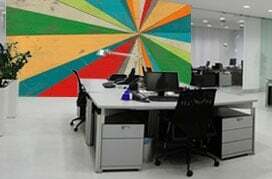 When choosing murals for the walls in your office space, lobby, waiting room, restaurant or cafe, neutrality and visual appeal of the theme is as important as its tasteful presentation. A perfect blend is possible--as you will see in these wall murals of modern patterns.